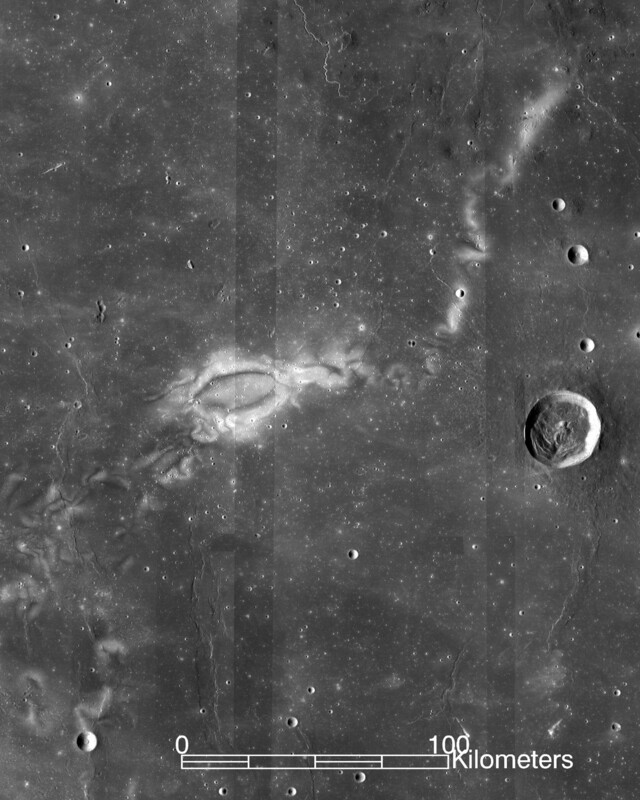 Research using data from NASA's ARTEMIS mission suggests how the solar wind and the Moon's crustal magnetic fields work together to give the Moon a distinctive pattern of darker and lighter swirls. The Sun releases a continuous outflow of particles and radiation called the solar wind. The solar wind washes over the planets, moons and other bodies in our solar system, filling a bubble of space — called the heliosphere — that extends far past the orbit of Pluto. Here on Earth, we're largely protected from the damaging effects of the solar wind: Because the solar wind is magnetized, Earth's natural magnetic field deflects the solar wind particles around our planet so that only a small fraction of them reach our planet's atmosphere. But unlike Earth, the Moon has no global magnetic field. However, magnetized rocks near the lunar surface do create small, localized spots of magnetic field that extend anywhere from hundreds of yards to hundreds of miles. This is the kind of information that needs to be well understood to better protect astronauts on the Moon from the effects of radiation. The magnetic field bubbles by themselves aren’t robust enough to protect humans from that harsh radiation environment, but studying their structure could help develop techniques to protect our future explorers. "The magnetic fields in some regions are locally acting as this magnetic sunscreen," said Andrew Poppe, a scientist at the University of California, Berkeley, who researches the Moon's crustal magnetic fields using data from NASA's ARTEMIS mission along with simulations of the Moon's magnetic environment. These small bubbles of magnetic "sunscreen" can also deflect solar wind particles — but on a much smaller scale than Earth's magnetic field. While they aren’t enough to protect astronauts by themselves, they do have a fundamental effect on the Moon’s appearance. Under these miniature magnetic umbrellas, the material that makes up the Moon's surface, called regolith, is shielded from the Sun's particles. As those particles flow toward the Moon, they are deflected to the areas just around the magnetic bubbles, where chemical reactions with the regolith darken the surface. This creates the distinctive swirls of darker and lighter material that are so prominent they can be seen from Earth — one more piece of the puzzle to help us understand the neighbor NASA plans to re-visit within the next decade.